Ready for the venom of Diamondback? From the time the construction announcement was made on August 6, 2008 until the ride's opening the following spring, Diamondback at King's Island was one of the park's most highly anticipated new roller coasters. An amazing ride with outstanding engineering and a revolutionary ride experience, Diamondback does not disappoint. Diamondback is a steel hypercoaster designed by Bolliger and Mabillard, the company that also introduced other innovative roller coasters such as Raptor at Cedar Point and many other scream machines. While Diamondback does not have inversions like so many of the world's most thrilling rides, it does have an outstanding, twisted layout that includes ten total drops, two forcible helixes, and other impressive features. Diamondback also includes a revolutionary splashdown ending. While other coasters have similar features, the splashdown is part of Diamondback's braking system, which also includes magnetic and mechanical brakes with multiple failsafes to ensure the ride's safety. Spread over ten acres, these features combine to create a one-of-a-kind roller coaster with the power, strength, and speed of one of the world's most feared and deadliest snakes. Diamondback at King's Island is ready to strike. While the statistics of Diamondback's construction are impressive, even more outstanding is its opening day auction. In partnership with A Kid Again, King's Island auctioned off the first series of rides on Diamondback with 100 percent of the profit going to support this charity to provide fun and suitable activities for children with life threatening illnesses and their families. The top bid was $5,000, and more than $100,000 was raised for this coaster's first amazing ride. In addition to the privilege of being one of the first to ride Diamondback, winners of the charity auction also received admission to King's Island for opening day of the 2009 season, commemorative tickets, and a special park souvenir. 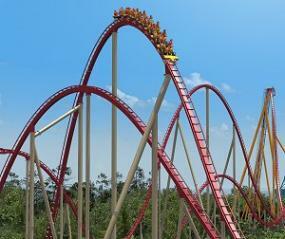 While Diamondback is an exciting and thrilling new ride, it isn't for everyone. The height requirement for riders is 54 inches, and the coaster is not recommended for riders who may have heart, back, or neck trouble, or those who may be pregnant. Riders must also be able to sit in the ride vehicles properly with all restraints, including individual hydraulic lap bars, fastened securely. Once aboard, riders on Diamondback will have a unique view of the ride's action with its V-shaped stadium seating. Designed to give every rider an unobstructed, panoramic view during the ride, Diamondback is the first coaster in the United States to feature this type of ride vehicle. This allows riders the full thrilling experience no matter where on the train they are seated, and can help reduce the often extraordinarily long lines for coasters' front cars. Still, since Diamondback is a newer ride and one of the most popular at the park, lines can be long. Riders are advised to leave loose or fragile items such as keys, wallets, and cell phones with non-riders or to secure them in a locker before entering the line. The ride is located in the Rivertown section of the park, with other rides nearby for less daring guests to enjoy. Its superb construction, smooth flow, innovative seating and braking, and otherwise outstanding ride experience have brought Diamondback numerous honors. In addition to being heralded as a fantastic ride by thousands of roller coaster enthusiasts, Diamondback was awarded the number two ranking for "Best New Ride for 2009" in Amusement Today's highly coveted Golden Ticket Awards. Undoubtedly in years to come, the coaster will also capture honors for being an outstanding steel coaster and a rider favorite. In just its first few weeks of operation, Diamondback at King's Island has drawn famous coaster enthusiasts, including Cincinnati Reds baseball players and Tommy Lee, founder of the rock bank Motley Crue. Will you be the next to ride? 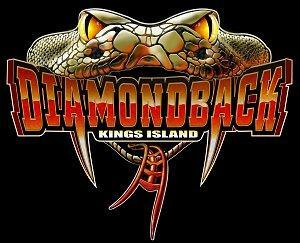 For more information about Diamondback, including ride videos, image galleries, and news releases, visit KIDiamondback.com.